Beginning Bodybuilding Workouts Get Big Now! Beginning Bodybuilding, Build Muscle Mass! We have created a great workout for beginners only. It is called "FTMF - Beginning Muscle Building Workout Routine" You will make great gains with this workout. My name is Eddie Cervantes I am a Certified Fitness Trainer/Specialists in Performance Nutrition. I have used this workout program on clients who want to build muscle and are new to bodybuilding with great success. We sold this workout on other websites for $19.99. We have received great response on this workout. We have used a scientific approach to bodybuilding involving the manipulation of fast - twitch muscle fibers and the overload principle to create this mass building workout. For a short time we will offer this beginning muscle building workout for $9.99. You will see results in 2 weeks of training with proper nutrition. When you order this workout program you will be sent a receipt intermediately. Once we receive your payment we will email one workout program routine to you the same day! You won't be sorry you did this for yourself. Good luck, build muscle. For a lot of people the thought of lifting weights sounds like a lot of work for little reward. I personally look at bodybuilding as a long term journey. Bodybuilding, weight lifting and exercise in general are activities where time is on your side. See most people want to build muscle and get in shape for summer so they can look fit in there bathing suits. So they start working out a few months before summer and wonder why they did not reach there goals to change there body composition for the better. Don't expect me to provide you with any so-called success stories, let's get this straight right now. Some training methods work better than others, but there are no secrets to building muscle. Our intention is to teach and guide you through the beginning of your weight training so that you can take your training to the next level and design a personal routine that meets your needs. Now let’s get to work. What I am going to do is give you a workout routine for a person who has never worked out with weights. You can do this training at home with a home gym with out a lot of equipment and make great gains. I personally would recommend working out at your local gym. When you train at a commercial gym it builds energy, motivation and if you ever need help you have someone right there, not to mention all the equipment for future use. Beginning bodybuilders should start working out three days a week or every other day so your muscles can get adequate rest for recovery. You must choose a routine that works every major muscle group. Start off with compound exercises. Compound exercise will fire up as many muscle fibers as possible to stimulate the kind of deep growth you're looking for. Let’s take a look at the difference between compound exercises and Isolation exercises. Compound exercises move the body through more than one joint movement, while isolation exercises only move the body through a single-joint movement. The best exercise to show you the difference is the barbell squat. The squats are the #1 exercise of all compound exercises. 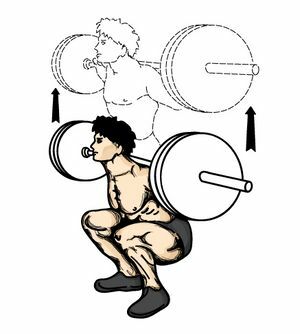 The barbell squats moves your body using a majority of your muscle groups and bends you at your ankles, knees, waist, hips, and to some degree, even your shoulders. Compare this to an isolation exercise such as leg extensions or leg curls which only moves your body by bending one joint...the knee. There are a few Bodybuilding supplements you should use. Make sure to drink a whey protein shake with glutamine half hour before workout and a half hour after working out. Also take a good multi-vitamin, after training for a while you can add other bodybuilding supplements to help you reach your goals. Give this workout 3-6 months and if done right with proper nutrition you will see great results. Build a good foundation (muscle mass) before doing isolation exercises. Begin-Building-Muscle.Com Remember Determination is the key to success.